Indianapolis, IN – #KRUKEDSHARKKTEETH RELEASES an APPRECIATION ALBUM on #itunes, ‘#THANK #YOU’, for His 400,000+ #Twitter Followers, and the ONE MILLION Plus Song Plays of the Debut Free Online Release, POPHITZ. 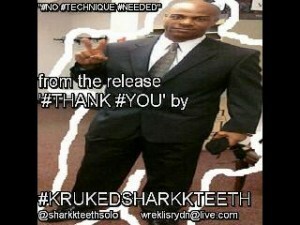 15 Songs from ‘THANK YOU’ are STREAMING NOW on KRUKEDSHARKKTEETH Soundcloud Music Page. Listen Before You Buy. ‘THANK YOU’ is Registered for the USA and CANADA Charts, Join the Journey, hear Music Art and See Vocal Visions. Enjoy the First Single, “NO TECHNIQUE NEEDED”. The INSTANT CLASSIC sets the foundation of a Long Successful Music career. Also, establishing that KRUKEDSHARKKTEETH can and will cross musical genres at a high standard and reach, plus attract massive diverse demographics of music lovers and listeners.